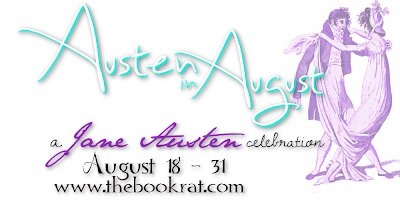 The Book Rat: More Scenes Jane Austen Never Wrote — guest post from Margaret C. Sullivan! 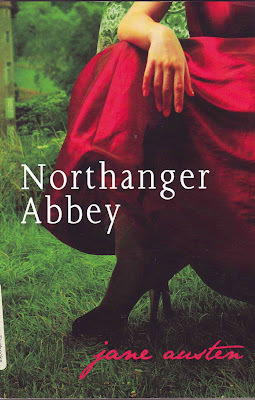 More Scenes Jane Austen Never Wrote — guest post from Margaret C. Sullivan! If you've been hanging around Austen in August this year, you've probably been enjoying Maggie's contributions to our yearly conversations (the most recent of which included Tom Hiddleston dancing, so. . .); if you've been hanging around AIA long enough, you've also enjoyed other awesome things from Ms. Sullivan, like the hilarious There Must Be Murder, the amazing Jane Austen Handbook, or that time she made Austen's heroes duke it out over their places Heroic Ranking Index. 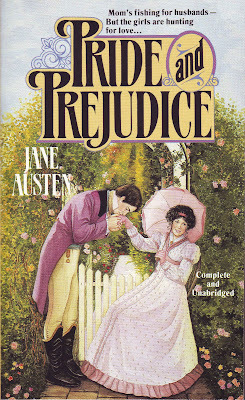 While writing Jane Austen Cover to Cover, I worked with a huge variety of editions of Jane Austen’s novels stretching over 200 years of publication--everything from first editions “in boards” (cardboard binding not meant to be permanent) to very recent editions created with 21st century style and design. 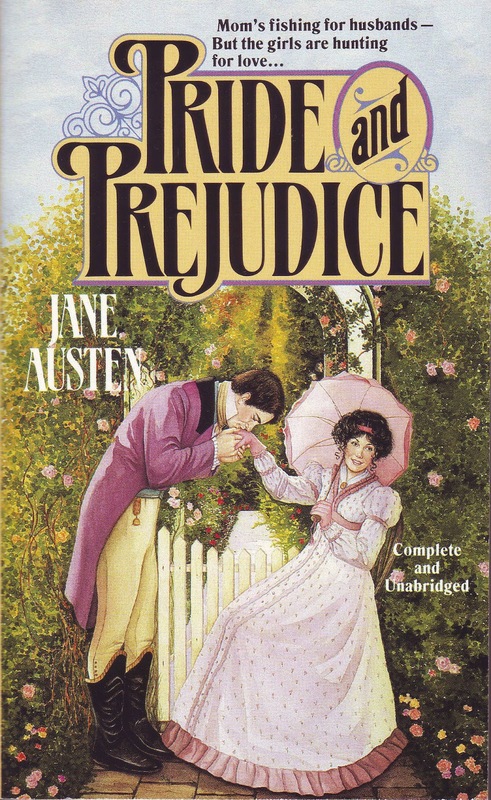 I’ve been collecting Austen books with silly covers (and snarking them on AustenBlog) for years, and I was thrilled at the opportunity to feature many of these weird, wonderful, hilarious covers in the book along with the beautiful ones. You have to wonder what Jane Austen would have thought about them--or the scenes she might have written based on them (but didn’t). I found this copy of Persuasion several years ago in a secondhand bookshop and had to buy it, because it is hilarious. It’s actually quite a nice illustration, but has little to nothing to do with the Royal Navy of Jane Austen’s time. 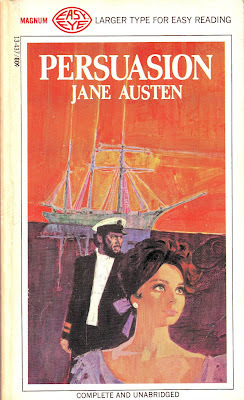 Captain Wentworth looks like he’s been skippering a New England whaler in the 20th century, rather than a Royal Navy frigate, and Anne Elliot could have stepped out of a 1960s fashion plate. They did, however, get the ship right, and that’s important! Because Jane Austen’s books are in the public domain, anyone can republish them, and many have--in some cases, one presumes, without much consideration for the actual story or the time period in which it is set. Some recent editions have been published with covers using vaguely romantic-looking stock art, including this edition of Northanger Abbey showing a woman in a red ball gown squatting in a very unladylike attitude. Well, we know that Catherine Morland played “base ball” with her brothers--perhaps her position was catcher. When ITV showed its “Jane Austen Season” in the UK in 2007, with new adaptations of several of Austen’s novels, the Daily Telegraph commissioned a set of Austen’s six novels, already in print from J.M. Dent, with new covers. The books were available at a chain of coffee shops, and could be obtained for free with a coupon from each day’s paper. A friend in London was kind enough to collect them for me (thanks, Kathleen!). The cover images range from attractive to a little odd to...well. Mr. Edmund Bertram and Miss Fanny Price were found in the Mansfield Park drawing room asleep together on the sofa, surrounded by cake crumbs, flower petals, and feathers. Lady Bertram’s pet canary had escaped from its cage and was found hiding in the curtains. Having been so compromised, and the possibility of their marriages to the Crawford siblings having disappeared, the Bertrams hastily married them off. The Crawfords didn’t quite get the revenge they were seeking by sending the cakes, made from a special recipe that their uncle, the admiral, had brought back from his travels. 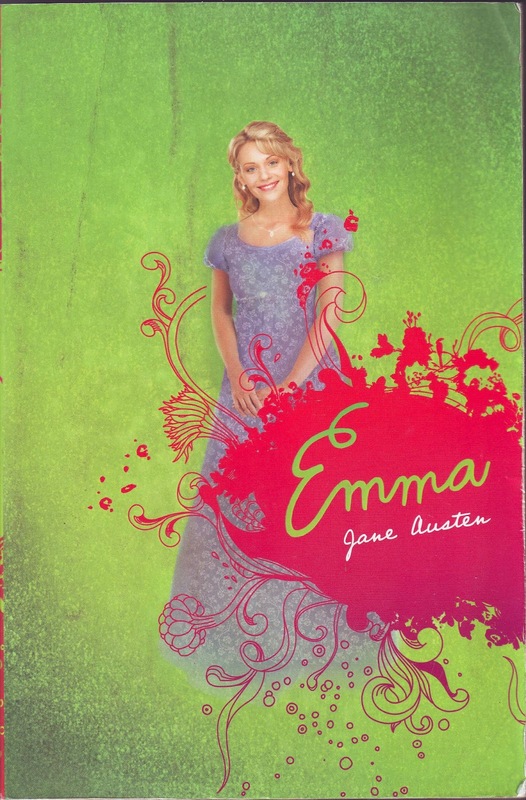 In honor of Misty’s well-known affection for YA literature, I’ve included an edition of Emma meant for teens. 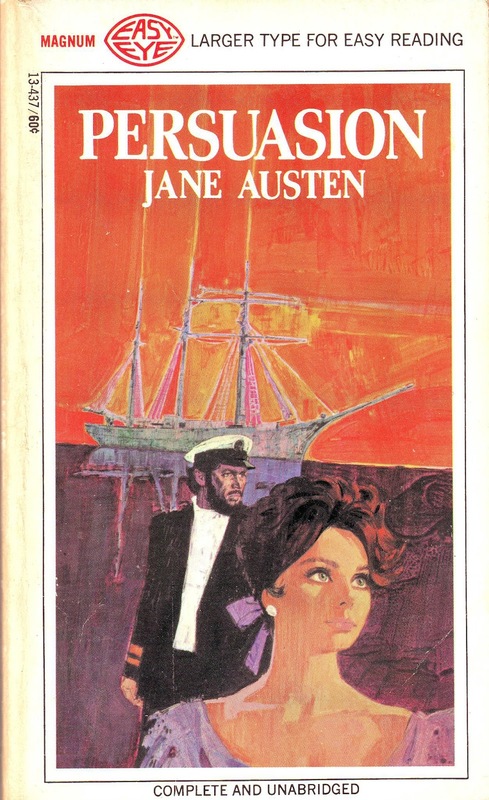 Puffin Books (a division of Penguin) has long produced editions of classics directed at the teen audience, and this edition casts Miss Woodhouse as an adorable teenager. One wonders what they would do with Mr. Knightley; this could quickly swing into Creepyland! New from Donwell Toys, it’s Emma’s Dream Woodhouse! Comes complete with a shrubbery for afternoon walks on fine, dry gravel; a horse and carriage*; extra guestrooms for Emma’s BFF Harriet to stay over; a round Pembroke table for Papa; all the accessories for painting, picnics, taking food to the sick, and making thin gruel. Extra marriage proposals included, and one very dependable hero in gaiters. The Mansfield Park one is like something from my nightmares!!! those covers are bad but fun writings about them. I've seen tons of cover using old paintings, I think I prefer those the best. thanks for this & have a lovely day. What a hilarious post! Thank you, Maggie, for making mr laugh!! Repeatedly. ROFL from "understudy for a bad community theater production of The Ghost and Mrs. Muir." Also wondering if the girl in the red gown found the line too long at the ladies room. 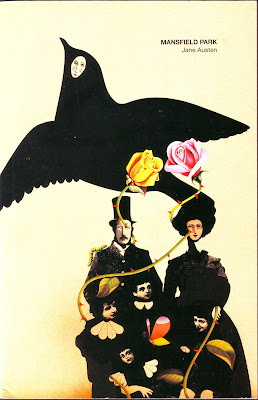 And that Mansfield park cover! Did Terry Gilliam draw it? I meant "me," not "mr," though I'm sure he's laughing too, whoever he is. Yep, the warning was right on with me. I gigglesnorted through the lot of these. And I thought with the one of Darcy smoking and being a gangster was hilarious. Some of these like the MP cover are just weird. After seeing so many terrible covers, I just keep wondering if publishers had a marketing department? Did anyone really look at these before they put them on the market? Of course, if they did, we would have this hilarious post or the gloriously bad covers. Still, I wonder how these came to be. I love the comments referencing some of the covers. oh, my.